The GridGuard HTTPS certificate is the certificate used when accessing the GridGuard server via HTTPS requests on port 443. 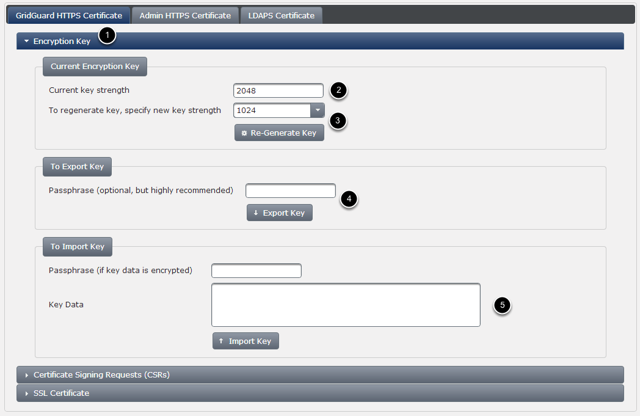 The Admin HTTPS certificate is the certificate used when accessing the GridGuard server via HTTPS requests on port 8443. 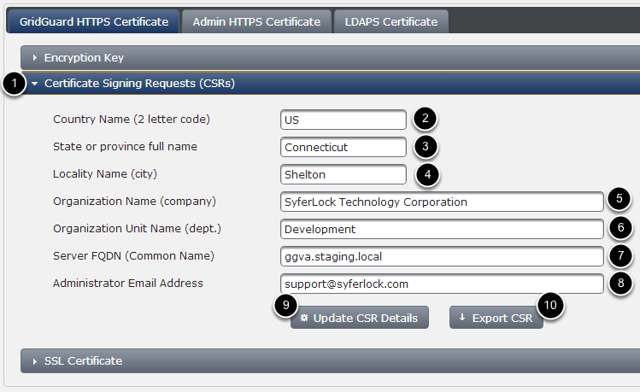 The LDAP Certificate is the certificate used when accessing the GridGuard server via LDAPS over port 636. 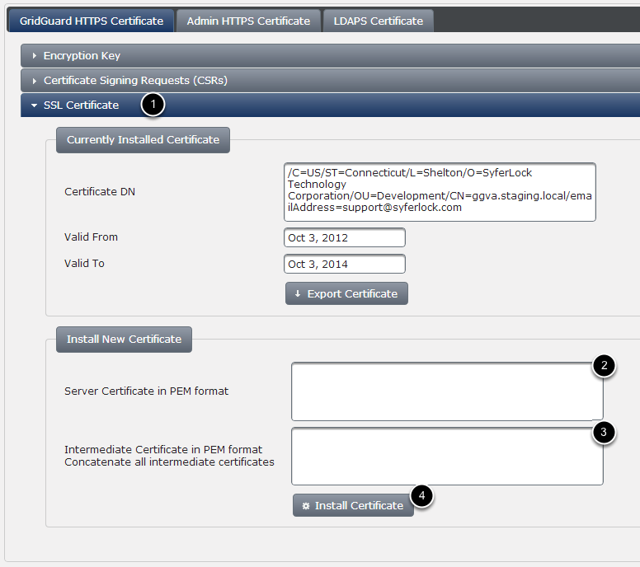 The method for updating the certificate for each of the 3 certificates is the same. So, choose the appropriate tab and follow instructions provided below. To import a key, provide the pass phrase that was provided while exporting the key, copy & paste the key data and click 'Import Key'. Key data must be in PEM format. Note: Updating the encryption key will result in the CSR being updated & the SSL certificate being replaced with a self-signed certificate. Update full qualified domain name of the server. This should be the name that clients will use to refer to the GridGuard server. Click 'Export CSR' to save the CSR file locally. Provide the CSR file to your Certificate Authority of choice. They will in return, provide you with an SSL Certificate. You will import this certificate into the system in the next step. Click 'Install Certificate' to complete the installation. Certificate installation will take a few minutes to complete once you click the 'Install Certificate' button. This is normal. Prior to importing a SSL Certificate with a different signing key, please make sure you have imported the encryption key before you try to import the certificate.